In the weekend before last's Catholic Herald, the conservative Catholic apologist Mark Shea told us not only to stop arguing about the liturgy, but to stop thinking about it. At least, I think that's what he was saying, the article is a little obscure - you can read it (or a slightly longer version) on his blog here. The fact that it appeared simultaneously on his blog - without any reference to the Catholic Herald - presumably explains why it makes no concession at all to a British audience. Philistine that I am, I confess I was completely baffled by the American cultural references. I resorted to Googling Lincoln's assassination, but apart from being reminded that it took place in a theatre, I am none the wiser. What does it mean? And who is Dave Brubeck? Let's hope it's not important. I don’t want a liturgy I can look at. I want a liturgy I can look along—to see God. Liturgies should be like a well-done play: anything that takes you out of the story is bad. To liberals, comparing Mass to a piece of theatre is like showing a red rag to a bull. They want it to be natural and spontaneous. Nevertheless, Shea has a point: you need to lose yourself in the liturgy. The trouble is that doesn't make the point he wants it to make, which is that thinking about the liturgy is a Bad Thing. There may sometimes be an element of 'I murder to dissect': if you are thinking too much about how the poet is producing his effect, it won't have its effect on you. But it equally won't have its effect if you can't understand the words or images or references (like me reading Mark Shea's blog), or if it is being read badly or printed in the wrong order. So learning about poetry or drama and getting a good text or a good performance will ultimately enhance your experience. 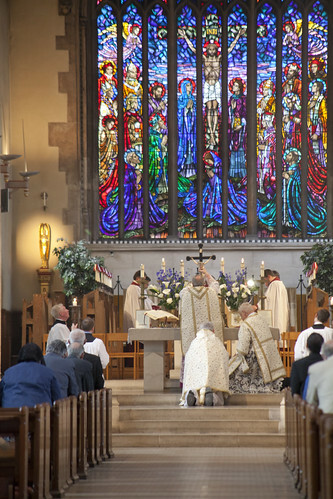 Learning about the liturgy, and attending its worthy celebration, will enhance your liturgical experience. If liturgy is important, as Shea presumably thinks it is, if he thinks it allows you to 'look along - to see God', then we need to argue about it a lot, we need to make it better, we need to adorn it with the best music we can and art set it in the best architecture. There's no easy escape for those 'conservatives' who don't want to takes sides on liturgical issues, I'm afraid. The Catholic Herald has published a letter of mine about this article. Here it is. 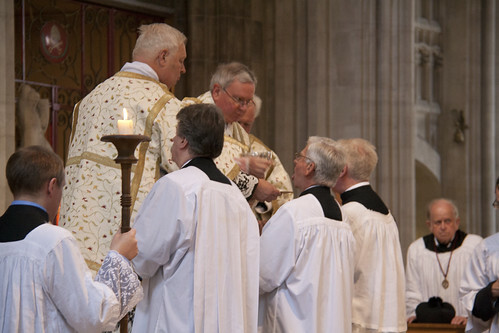 It is perhaps understandable that, after a century of debate about the liturgy in the Catholic Church, Mark Shea (Comment, 16th August) should express the desire just to attend Mass without thinking about it too much. liturgy and abuses harder to bear. Over the decades liturgical meddlers have done incalculable damage to the spiritual lives of ordinary Catholics. It doesn't follow that we must profess ourselves content with the waste-land they have so often produced: on the contrary, we must see how the damage can be repaired. Pope Benedict showed us how to begin a liturgical restoration which will provide for our spiritual needs, notably by encouraging Communion on the tongue, celebration ad orientem, and the Traditional Mass. Shea may be feeling weary of the battle, but bad arguments and poor scholarship must be replaced by better, and a banal liturgy with something which speaks to us more clearly of heavenly things. 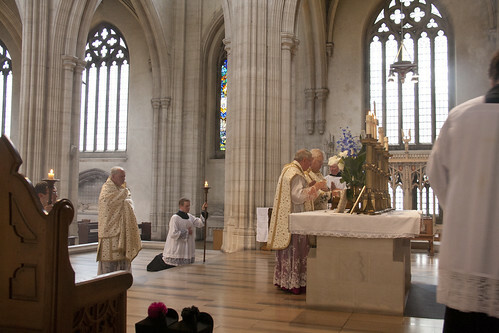 Pictures: different angles on the liturgy: Solemn Mass for the Latin Mass Society's Annual General Meeting in Southwark's St George's Cathedral. More photos. I typed the above comment on my iPhone, and for some reason was unable to finish the last sentence. I was trying to say 'Hope the You Tube links work'. I have just checked, and they do! You do know Dave Brubeck, right? Just in case, he was (died recently at the age of 91) one of the top jazz pianists of our time. His band was around for decades. He wrote some excellent music, such as Take Five. He was also Catholic. Please give his music a try. Thanks! I think I would draw a distinction between ;thinking about the liturgy' and 'thinking about the liturgy during the liturgy.' The former is essential; the latter is sometimes a distraction. Walsingham live bloging: we're off! Regina Magazine: interview with LMS Chairman!